Changing your shower head is an easy way to upgrade your shower area without putting stress on your budget. 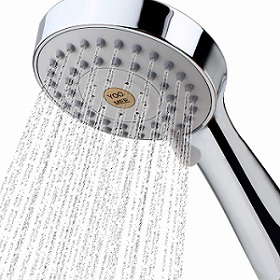 However, many homeowners do not replace their shower head unless it’s broken or has poor water flow. Unfortunately, they do not know that they are supposed to change their shower head every ten to twelve months. This is the primary reason why you should always keep your eyes open for the best massage shower heads. Shower heads come in different specifications, sizes, and designs. This can make it challenging for you to choose one that will be ideal for your bathroom. If you want to have the best showering experience, you should take out the time to check your options. For instance, you should focus on shopping for the best massaging handheld shower head if you enjoy winding down after a long day at work. We will now take a close look at the ten top shower heads that are designed to help your muscles feel at ease. The YOO.ME High-Pressure Handheld Shower Head should come by your number one choice if you are the type that likes to take a long shower. It has a simple design, but it’s extremely effective and reliable. Its 2XP turbo powered showerhead conserves water. This will help lower your monthly water utility bill. It’s not unusual for minerals to develop in conventional shower heads. Fortunately, you will not have this problem with the YOO.ME. The silicone rubber jet nozzles make it extremely easy for you to keep this shower head clean. You can clean the shower head with your fingers. You can extend the shower head’s life if you clean it regularly, so it is reasonable to say that the YOO.ME handheld showerhead will last for several years. Just imagine the hot water flowing out of this showerhead while the water pressure slowly increases. Unlike other similar shower heads, the YOO.ME has a stainless steel hose durable brass fittings. The YOO.ME belongs on any list that details the best massage shower heads. 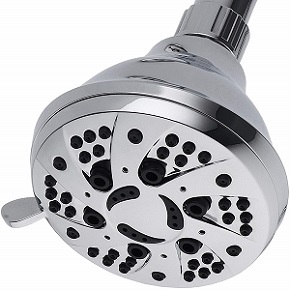 Because of its unique features, it’s not a surprise for many to say that the 6 Function Adjustable Luxury Shower Head is the best massaging handheld showerhead. This is the showerhead you should take notice of if you are fond of shower heads that allow you to control the water flow. This specialized shower head has the following six settings: gentle rain, pulsating massage, saturating power blast, water saving, and two mixed modes for your delight. With these characteristics at your disposal, you can look forward to getting a great shower every time. The 6 function is not like the other flimsy models that you will find at your local hardware or retail store. It is incredibly sturdy. It’s made out of heavy ABS plastic. This type of plastic has a solid reputation for holding its own under high usage, so you there’s no need for you to worry about this shower head falling apart on you. 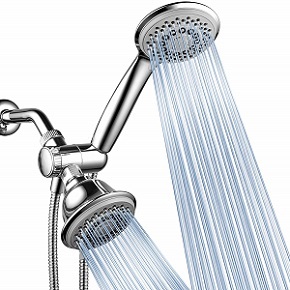 Have you experienced problems with installing shower heads in the past? Fortunately for you, the 6 function shower head is relatively easy to install. Just twist it on and you’re good to go! It’s imperative to point out that the manufacturer spared no cost while creating this shower head. With self-cleaning nozzles and six settings on deck, it doesn’t take a rocket scientist to see that the 6 functions. We have another shower head with multiple settings. However, this model has five. There’s no reason for you to call a local plumber. You can install this shower head in less than thirty minutes without special tools. Before you get nervous, please take note that it is compatible with any shower arm. This attractive massage shower head is constructed out of ABS plastic material, and it has a shiny chrome plated material surface. This helps it compliment any contemporary shower area. The swivel ball bracket will make it extremely easy for you and your family to enjoy a pleasant showering experience. Pets normally don’t come to mind when you discuss the best massaging handheld showerhead. In this instance, you can wash your cat or dog with this shower head. Just adjust the setting to their comfort level. What makes this shower head so unique? It is lightweight and lead-free. Besides being easy to use, it will not put your health in harm’s way. Some massaging shower heads are difficult to handle, but the Ergonomic grip will help you hold this shower head without any difficulty. At the end of the day, simplicity goes a long way. This model gets high marks for its design and features. The Hydroluxe 1433 Handheld Shower easily falls into the ranks of the best shower massage heads. This model has a futuristic name and a sleek design. This is the main reason why it is one of the most popular shower heads in the market today. This model comes with two shower heads. It may seem like it’s a challenge to install, but it’s quite easy. You don’t need tools, and you can have it working in less than fifteen minutes. The overhead shower has five deluxe settings, and the hand shower also has five precise settings. What makes the Hydroluxe 1433 outstanding is that you can choose from 24 different water flow patterns. Can you imagine how your body would feel after taking a shower with the Hydroluxe 1433? Both shower heads have the following settings: stay-warm mist, massage, power rain, pause, and a water-economy setting. The stainless steel Hydroluxe 1433 has a smart three-way water diverter with an anti-swivel lock nut. 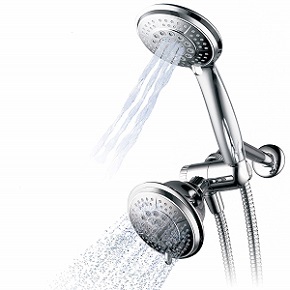 This performs it easy for you to adjust or move the shower head to your liking. This is the showerhead you need to consider getting if you are ready to take your showering to the next level. It can make you feel like you are showering at a five-star hotel. The top picks massage shower heads should have a feature where the user can adjust it to where it will distribute water for ideal coverage in the shower. The Speakman S-2005 is no slouch in this department. It comes with patented. Any stream 360 degrees technology that allows users to make precise settings to suit their personal taste. What stands out about the Speakman S-2005? It has special plungers that regulate the spread of water as it leaves the nozzle. This makes it easy for the water to build and intensify with each second. In all fairness, this is one neat feature that you will not find in the other models on this list. In short, the water flow will start slow, but it will gradually build up strength. Is it easy to clean? Absolutely! The self-cleaning plungers are designed to minimize sediment and hard water build-up. The Speakman S-2005 can be found at many beautiful hotels around the globe. It has 58 customizable sprays and an attractive modern design. It can transform you showering experience immediately when you turn it on. There’s no reason why you should ignore it. Your sore muscles will appreciate you if you decide to get it. Don’t worry about calling a handyman to install this shower head in your bathroom. This is another shower head that does not need professional installation. It is compatible with any standard shower arm, and it will be installed within minutes. Let’s take a look at the AquaDance features. Who wouldn’t fall in love with a shower head that has multiple settings? The AquaDance has the following six full-spray settings: rain massage, power aeration, water saving pause mode, pulsating massage, aeration rain, and power rain. With these settings at your command, your muscles will be craving a hot shower every day. Is the AquaDance maintenance free? It would be a far extent to say that its maintenance free, but it is very easy to clean. The click lever dial rub-clean jets are simple to clean and they resist lime. You don’t have to worry about unattractive calcium ruining the appearance of this shower for years. The AquaDance has an angle-adjustable contemporary design. You can adjust the head on the fly during your shower. It is designed to move with ease. 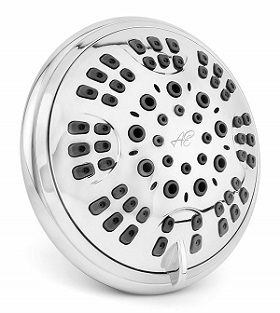 If you want a reliable shower head with a simple design, the AquaDance should be on top of your list. We are confident that it will meet your standards. 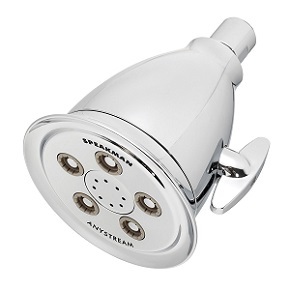 It’s really no surprise that the Culligan WSH-C125 made a list for the best massage shower heads. It passed the EPA water sense certification standard of a maximum of 2.0 gallons per minute or less. 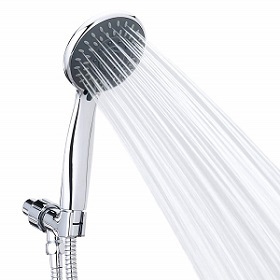 The Culligan shower head can be installed on any conventional 1/2” threaded shower arm. You don’t have to worry regarding this massage shower head clogging. The anti-clog rubber spray nozzles will help keep it clean. At the end of the day, your showers will not be interrupted by a clogged spray nozzle! The Culligan WSH-C125 has five distinct spray settings for your comfort. You can adjust the shower head too high if your muscles are tense, or turn it down on low if you simply need to take a quick shower. Just like the other models on this list, this shower head is extremely easy to clean. However, Culligan has a patented filter that limits or fights bacterial growth. This provides you peace of intention in knowing that your hygiene and health will not be compromised. This is one feature that cannot be seen in the other models on this list. It’s also imperative to point out that the Culligan has a whr-140 filter cartridge. This cartridge will have a big impact on your skin and hair. Don’t be surprised if you get softer skin and hair. Does the Culligan have fancy features like other shower heads on this list? No, but it’s extremely reliable and it will perform well for you. If there is a shower head that can make you feel like you are in the Rain Forest, the 6 Inch High-Pressure Rainfall Massage Shower Head is more than capable of getting the job done. It can compete with the high-quality models that you will find in the most beautiful hotels. Operating with fifty-seven jets makes this shower head a true contender with the best shower massage heads. We only selected the shower heads that are easy to install. We firmly believe that it would not be in your best interest to compile our list with shower heads that require professional installation. The 6 Inch High-Pressure Rainfall Massage Shower Head is no exception. It is designed to fit basic U.S. connections. You should be able to install it within minutes. It has an anti-rust metal swivel ball that makes it easy to adjust. It will hit every corner of your shower area without any difficulty. The removable flow regulator is probably the best feature of this Rainfall Massage Shower Head. You can open the head for strong water flow and you can adjust it to the point where you will get low water flow. It was designed to work as a real steam shower. The 6 inches can be detached when it’s time for you to clean it. Removing the build-up will be as easy as taking candy from a baby. 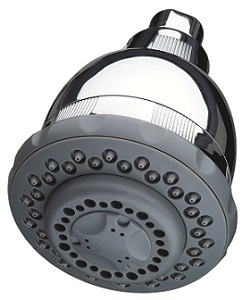 A simple design and operation make the 6 Inch Shower Head is a perfect choice for its price. Nearly two gallons of water will flow from The Niagra Conservation every minute. 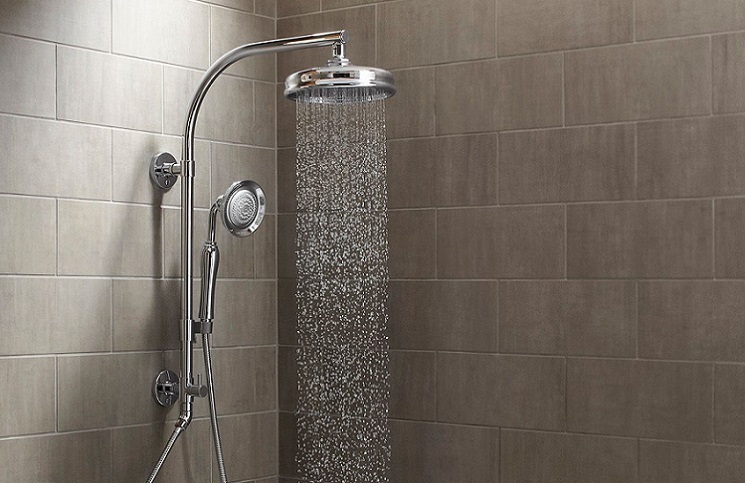 This energy efficient shower head is designed to help you save money on your water bill. Unlike some other models on this list, the Niagra will only produce the water you actually need for your showers. In some respects, it could be labeled as a Smart Shower. 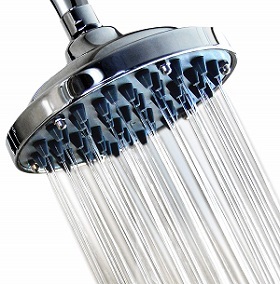 What makes the Niagra stand out as one of the right shower heads in the game today? It has a powerful nine jet turbo massage that gives you full control over the settings. The settings range from forceful to gentle. The tangle-free hose is close to 72 inches long. It will be effortless for you to handle the Niagra while showering. The length of the hose gives you an opportunity to shower every part of your body in pure comfort. The Niagra does not have the sleek design that other shower heads have, but it gains more ground in the efficiency department. It’s also vital to point out that it is self-cleaning. The Niagra Conservation 2.0 GPM should be on your radar if you are in the market for a simple shower head that does not use excessive water. It is also refreshing to know that it is virtually maintenance free. The name alone should tell you that it would be a huge mistake for us not to consider this model as one of the excellent massage shower heads. With two shower heads at play, it has a hi-tech design and it will produce a generous amount of water. Let’s look at the rainfall showerhead. It is four inches in width and it has click lever jets that can be cleaned without too much effort. It’s not a stretch to say that its beautiful chrome finish puts this shower head in a class all by itself. Now let’s look at the other shower head. The Hotel Spa 30-Setting comes fully equipped with six setting durable hand shower and three-way water diverter. You have the following settings with this hand-held shower: pulsating massage, power rain, rain massage, water saving power mode, power mist, and rain mist. As you can clearly see, you have plenty of water flow options on the table. What makes the Hotel Spa 30-Setting unique is that it comes with an adjustable overhead bracket. Why is this important? Well, the bracket will make it possible for you to point the head in any direction and use it hands-free. The Hotel Spa 30-Setting will give any shower head a run for its money. It has the design and features that can please people from all walks of life. There are tons of different shower heads being said in the market today. However, all of them are not created equal. 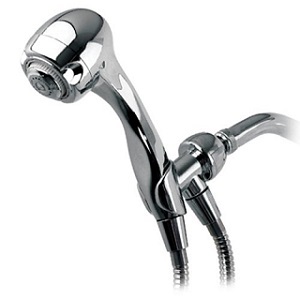 We decided to make things easy for you by compiling a list of best massage shower heads. Each has its own special features and unique qualities. Price is another thing that we took into consideration. We really didn’t want to give you expensive choices that would probably push you beyond your budget. Why go with an expensive model when you have several inexpensive models that perform equally well? When you highlight the best shower massage heads, the Hotel Spa 30-Setting takes the spotlight. It has an incredible design and immaculate features. However, you will not miss the mark if you decide to go with another shower head on this list. All of them will surpass your expectations.